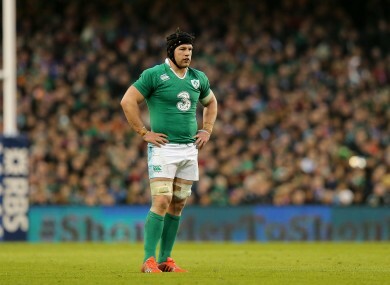 Joe Schmidt has a lot of back row options for the England game – Sean O’Brien at eight is one of them. O'Brien made his first Ireland start since the 2013 autumn tests last Saturday. WITH EVERY PASSING game the legend of Joe Schmidt grows as he continues create effective game plans and do the very best with the talent at his disposal. And while the kiwi coach has worked wonders it is worth remembering just how much talent he actually does have at his disposal. Being able to spring Cian Healy and Iain Henderson from the bench is a luxury most head coaches have to go without and the strength in depth of the Irish squad is highlighted with the injury to Jamie Heaslip – Schmidt has a few different options available. In fact, the back row that was selected to start against Italy could all rotate with each other, with Peter O’Mahony, Sean O’Brien and Jordi Murphy all capable of playing 6, 7 and 8. Sean O’Brien says he would be comfortable filling in at Heaslip’s position but won’t be banging on his coach’s door demanding the role. “He tells me where I’m playing, I don’t go ‘here Joe, I’m playing No 8′,” O’Brien said. O’Brien understands how much competition is in the squad better than most. During his 18-month absence from the green jersey Chris Henry, Rhys Ruddock and Tommy O’Donnell have all worn the openside shirt with distinction. O’Brien says that everyone within the squad now knows that almost nobody is irreplaceable. “It was a massive thing that the players discussed a few years ago, how strong the squad needed to be and how our bench needed to be as good as the lads starting the game,” O’Brien said. With the collisions in rugby becoming bigger every year, it is becoming more and more obvious to everyone how much danger the players are putting themselves in every time they take the field. Even during his lengthy absence, O’Brien always thought he would make it back but the injury break forced him to consider his options post-rugby. “Retirement or anything like that never came into my head but you are always thinking of [life] after rugby nowadays,” O’Brien said. “I never thought of it before but now you know that you need something there. You could be finished tomorrow, for instance, and you have to be as best prepared as possible if it does. After Mathieu Bastareaud’s clash with Johnny Sexton last weekend, people debated the dangers of leading into the tackle with a raised forearm. As someone who loves a good hand-off, O’Brien thinks that part of the game can’t really be eradicated. “I don’t think so,” O’Brien answered when asked if he thinks leading with the forearm should be looked at by the authorities. Email “'He tells me where I'm playing, I don't go 'here Joe, I'm playing No 8''”. Feedback on “'He tells me where I'm playing, I don't go 'here Joe, I'm playing No 8''”.